Two new White Denim releases are now available! Let me briefly tell you about them. 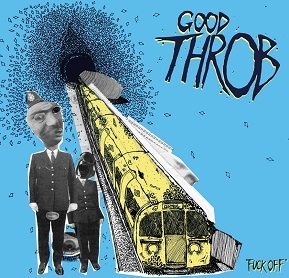 Good Throb need little introduction, being one of the finest punk bands in our modern time, but in case you aren’t already on their tip, imagine the Feederz and Kleenex sharing a practice space and switching instruments. Snarling, pissed-off punk with a bass guitar that sounds like a rubber band. They’re from London and they recently tore a hole in the US on a brief tour. Listen to “Acid House” here. Räjäyttäjät are the second Finnish group to be released on White Denim, and without a doubt one of the wildest rock groups I’ve ever encountered. I spent one night with Räjäyttäjät in Tampere, and by the end of it I had a broken nose, the Räjäyttäjät singer was headbutted by the club owner and it still didn’t stop him from exposing himself to the security guard. Their music is just as horribly amazing – somewhere between Ebba Grön, Tampax, Jerry Lee Lewis and Sweet do their tunes reside, but with a fidelity entirely their own. Listen to “Tulee Taas” here. In case you didn’t notice, I listen to a ton of electronic dance music. 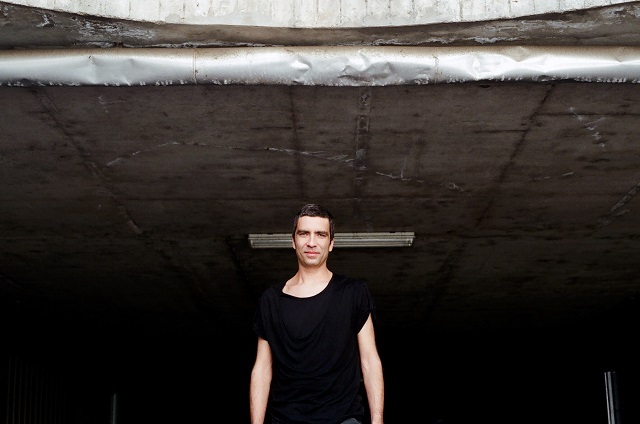 Sometimes it can all blend together, but it never takes me more than a few seconds to identify any Petar Dundov track on shuffle – his distinct sound is a bright signal cutting through the noise. From Croatia, Dundov crafts these epic tracks that feel like Asia’s “The Final Countdown” distilled through a minimal-techno filter, like you’re watching Rocky 2 from a deck under the midnight stars while a thumping Ibiza party blazes beneath. It’s really great music, and the type of universally enjoyable sound that I’ve been able to turn decidedly non-techno friends onto. And after this music-positive conversation we had below, I just want to throw on “Sparkling Stars” and drive a motorcycle to the moon. You seem to have found your “sound” pretty early on in your career. Is that a safe thing to say? Do you feel like you’ve been creating music in the same general spectrum for a number of years now? Well it would be fair to say that it took some time for me to build my own sound. My early music was very melodic with pretty basic arrangement. I had only one synthesizer at the time and a small sampler. Possibilities with sound programming were pretty limited, so I expressed myself mostly in a tonal structure, harmony and multi-layering of sounds. As time passed I was able to get some serious equipment, synths, samplers and effects so my focus shifted in direction of sound design. Music became more simplistic in arrangement; more abstract. Sound and atmosphere became my main interest, particular mood expressed only with modulation of particular sound. Evolution from simpler structures to richer harmonic content, that was the thing for me. I spent many years experimenting with minimalism and at a certain point I realized that to move forward in expression I needed to introduce another element and step away once again to a point of more complexity. As I look back my sound pulses between harmony and chaos, only thing that changed is my ability to create a good mix where all those elements come together in a natural balance. That is my general direction that I am following for a number of years now. Through your last three albums, do you feel as though you have developed a distinct personal sound? Yes I do. I believe that music is just another way of encoding information. Like for example, if you are an author writing a book, you will have a desire to write about things that matter to you, certain themes. Imaginary or real, it doesn’t matter, and in time you will go deep in it and reveal something that was not so apparent for a reader in the first place. Also you will start to use language in particular way: some words will occur more often than others, etc. For me it was a combination of skills, technology and an internal urge to create something that I believed at the time was missing in club music in general. I remember talking to some experienced musicians and they argued that club music has a limiting factor in how far you can go in complexity, melody and harmony, like average people will not have a capacity to follow the music if there are too many things going on. I didn’t agree and I don’t really think there is a limit, just that we need more efficient techniques to do it. So I experimented with improvisation, introduced a solo instrument that will lead the entire song, something not so common in repetitive dance music. Also every main instrument has a tonally opposed partner in bass or a following instrument, so harmony is created as a third element. My style is in these simple basic rules. Would you ever release music that seems incongruous to all that you’ve done so far? When I am composing I don’t strain myself to any boundary. But this is my personal perspective what my boundary is, and musically I stretched myself pretty much in the last couple of years. I like experiments, but what comes out as a release has to be refined to a point that it can participate in a meaningful way with previous releases. Sometimes to do something radical can be meaningful but it will still have a personal, recognizable musical signature. When you are writing your songs, are you thinking about how people will relate to them physically, or mentally? Or is the audience not a factor in your creative process? When I am writing a song I am completely in the song itself. It is not like you are separate from anything, more like you are being and feeling everything. It is as if you are a part of a collective, universal consciousness that is manifesting itself right now through you. I have a feeling that I am an audience participating in the event of creation that is outside my ability to comprehend what is going on. It is like subconsciousness is taking over and I am there just for a ride, enjoying in the ability to be the first to listen and enjoy the piece. I believe that what I feel other people will feel too; I don’t separate myself in that way when i am composing. It gives me much more pleasure and keeps me focused on what is really happening in undergoing the creative process. How often do you listen to your finished tracks? Are you usually just moving forward, working on the next thing, or do you spend any amount of time just sitting back and say, enjoying a track off Escapements? When I finish a track I let it go to rest for some time. After the production period, I probably listened it a hundred or more times over and over, so I am just happy that everything is nice and tidy and I can move to something else. Then usually when friends come in I play new songs and we enjoy it together. Then the release comes out and you listen to it again on a turntable. Then time passes, a year or two, and then I find myself picking a record again and having a listen. Sometimes it is an extraordinary experience. It is like coming back to a good book that you read before, but as time passed you have changed and now you see different things in it. Sometimes I even ask myself “Did I really write that?” because it sounds even better then when it came out initially. You’ve released some pretty lavish vinyl albums, with boxes, fold-out covers, and EPs with holographic center labels, etched and colored vinyl… is the physical presentation something that is important to you, or is it more of your label’s doing? Physical presentation is important to me in a sense that it communicates the content. In the beginning I thought that it was not so important to bother with presentation, but this was because of my subjective perspective as author. As if people already know what is on the record, and that simply is not true. My label opened my eyes regarding that, and since then we are constantly woking on different approaches how to match the music and visual presentation. I was not aware what kind of things you can do with vinyl regarding color, print and different foldings of sleeves, and the experience of the label was crucial to get all those nice covers. Is the vinyl medium something that is important to you? Does it matter to you that your music is pressed on records, and not just distributed digitally? Physical medium is important to me. It is like asking the mind if it needs its body. Maybe it is because I was born in time when the only way to get music was to buy a record, so it has a sentimental value to me. I can understand that today kids are brought up with iPods and digital players and they develop their own way to connect to music just through digital channels and that is alright. Do you consider your music to be ‘club music’? If not, in what kind of situation would you want your music to be experienced? Most of music that I write is dance music, so naturally it is played out more often in clubs. I really don’t have any preferences where my music should be experienced at. As I see it, music describes motion. It can be the movement of body or an imaginary, meditative exercise where you move in your inner space. I like to think of people participating in that motion, taking a journey with sound in dancing and joy. It can be any kind of situation as long as there is active listening and understanding involved. If I’m not mistaken, you’ve collaborated with others much more frequently in the past than in recent years. Is this accurate? If so, was this a conscious decision to work on your own, or just a coincidence? I used to work with many different people in the past. As time passed, I become more interested in particular things and that’s when things started to narrow down. There are still many people I could work with, but when you start to think about managing it all, it becomes a hard thing to do. Most musicians are touring all the time and just to find a week to work on something, it is very challenging. Are there any other contemporary electronic artists that you greatly admire or respect? If I am a fan of your music, who else should I check out? I like music from German duo Boozoo Bajou, they have timeless albums that you can listen to over and over. Also good to check out are Mountains. At some point I stumbled upon their album Choral… they do fantastic stuff and if you are into acoustic guitar definitely check them out. I tour practically all the time. Every weekend I am somewhere else. Usually summers are more busy, winters more quiet so I still have time for some serious studio work. I am trying to balance everything, to be able to work on music during the week and travel and perform over the weekend. One without another just doesn’t make sense to me. I think it is important for any artist to find the right balance where he can feel comfortable and creative. What is your live setup like? It is pretty much a standard live setup with synths and samplers. I still work with MIDI and I am trying to work with real hardware on stage, but as the world is turning to the digital domain more and more, sometimes I feel like a dinosaur. One thing that is essential for me is the ability to play live keyboards. Since most of my songs are played on keyboard, I try to bring that original performance on stage for people to see that it is not all about turning knobs. Also I need that real time control over tone to be able to set the right mood. Once when party takes off and people are into it you can do magic with simple phrases, but you have to be exactly on time and on the note and that is only possible if you have the actual instrument in front of you. What’s next for you, record-wise, or just in general? I am constantly in a studio working, experimenting, finding sounds for my next 12″. I also need to do an upgrade for my live performance system – there are many new songs I’d like to add. As I like to program stuff for some time now, I have been working on tools that will help me in studio work like mixing automation or algorithmic sequencers. I would like to finish some of those apps by the summer. Have you started working on another album, or is it not yet time? I have been telling myself that this year I will focus on singles, but music is an unpredictable thing, so I finished some songs that will turn up on a new album. I don’t know where my inspiration will lead me, and usually the desire to do something is good but only as a motivator or driving force. What you will create comes out from your subconsciousness and the best way is to not fight it because that is what you truly are. So I am happy that I am in a positive phase and I am sure that some of the songs that are coming out of me will be on a new album.